Turning an Umbrella into Bat Wings « Adafruit Industries – Makers, hackers, artists, designers and engineers! 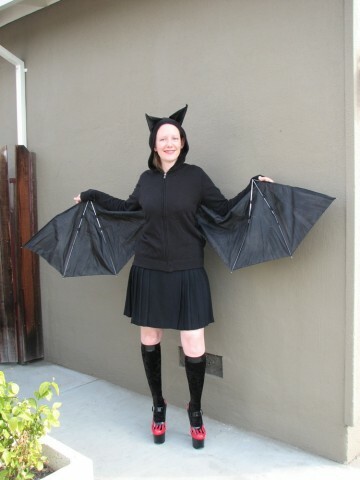 If you’re planning to dress like a bat for Halloween, you’ll need wings. Lenore of Evil Mad Scientist has come up with a method for making the wings from a black umbrella so that they look segmented like bat wings and so they can be folded and unfolded. It’s an affordable solution too since you can usually find umbrellas at bargain prices – you only need the most basic model. The process involves measuring, cutting, and stitching the bat wings to the shirt you want to wear with your bat costume. Lenore used a black zip-up hoodie. She used leftover umbrella material to make bat ears that she attached to the hood. Unscrew the top of the umbrella. 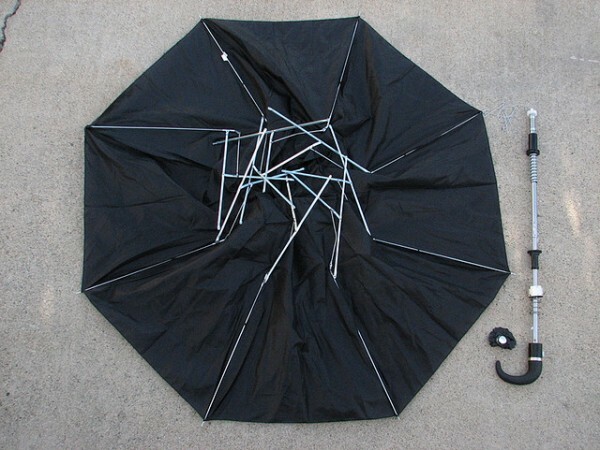 Pop off the short wires that hold the ribs to the part that slides up and down the stem of the umbrella – they are like staples, and you can use pliers as a staple remover. Then use the pliers to untwist the two wires holding the ribs to the plastic parts on the stem of the umbrella. Unthread the wires from the ribs, reserving wires for later use. Read more about the process at Evil Mad Scientist.